Sony is in a hurry. In the last few months Sony updated relatively young products (A7, A7r, A7s) and created a few entirely new product lines. Even their line of compact camera's (RX-10, RX-100) gets an update every year. And the updates are far from incremental: with each release Sony seems to want to wow customers with unprecendented features in smaller and smaller camera bodies. The latest release in Sony's stream of releases is the FS-5, a new camera line which seems to aim directly at Canons C100 Mk II. But while Canon takes it slow by leaving most of the specs unchanged, Sony bombards customers with advanced features like 240fps, 10-bit, and 4K. 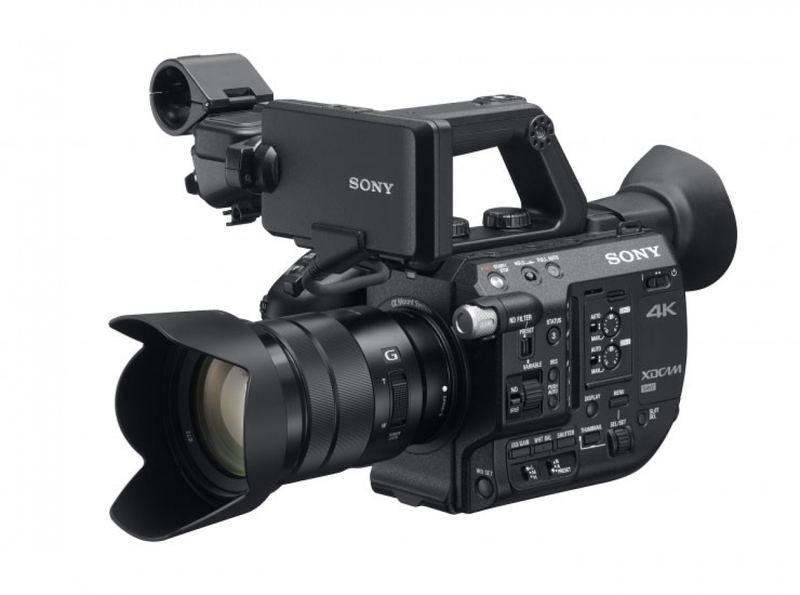 Looking at those specs, the new Sony is a much more advanced camera than the C100 Mk II. But the ergonomics and pricing make it a clear C100 alternative. The FS-5 takes more than a few design-clues from the C100 Mk II: the compact body, removable side-grip and top-handle and viewfinder at the back. In many ways the FS-5 even improves upon this design: the grip has multitude of assignable buttons, a h3er top-handle attachment and a monitor that can be attached anywhere on the body. What's even more astounding is how small and light the FS-5 is compared to the C100. This makes it even more suited for handholding over longer periods of time. It's designed to be used just like Sony's famous HVR Z1-series of camcorders: handheld for fast documentary and news style action. While the FS-5 seems to trump the C100 on both specs and ergonomics, there is one area where Canon traditionally excells: color science. Canon C-series cameras provide gorgeous skin-tones and natural colors out-of-the-box, whereas Sony's colors always need work. Especially when shooting in S-log2, it's hard to get skin-tones to look natural. I'm curious to see if the newly announced S-log3 will improve that.